Jonathan Snellenburg is the Director of Watches and Clocks for Bonhams New York. Snellenburg holds a Ph.D. in geochemistry, did post-doctoral work in extraterrestrial geology at the American Museum of Natural History, and graded diamonds as a gemologist for the Gemological Institute of America. Recently we spoke with Snellenburg about the impact of culture and technology on the evolution of timepieces, as well as the opportunities for novice and seasoned collectors alike. Swiss. 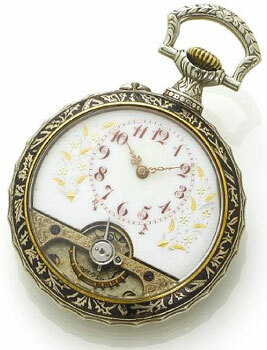 A late 19th century silver black enamel open face 8 day pocket watch. I grew up outside of Philadelphia. I didn’t have any particular interest in clocks or watches as a kid; that came after I started working at Christie’s East, where I ran the Jewelry and Silver Departments. When I arrived, I found watches basically sitting on my desk, so I began studying them, cataloging them, and doing watch sales. I don’t collect watches myself; I have more than enough clocks and watches that pass through my hands. It’s my own sort of virtual collection. I’m not an active collector of anything other than those that perhaps I am unable to sell. I’m more interested in the social history of timekeeping, how clocks and watches came to prominence during the 18th century and how they evolved from being luxury goods to almost commodities. The Industrial Revolution reduced the cost of making clocks and watches, which made them accessible to the public in general and caused their popularity to grow. I think that people don’t necessarily realize that the ability to own a watch or a clock at a modest price is really something that didn’t happen until perhaps the middle of the 19th century, certainly with watches that were being produced in Switzerland and in America. At the beginning of the 18th century, people basically told time by the sun, the moon, the changing seasons. By the end of the 18th century, telling time by looking at a clock was firmly established in Europe and America. With that came a demand for timepieces that could be purchased at a modest price. In America, the Willard family outside of Boston began producing longcase clocks at a reasonable price. In France, Frédéric Japy invented machinery that allowed the rapid production of watch and clock movements. The development of the clock industry in the Connecticut River Valley in Thomasville was another milestone. The very first watches and clocks with verge escapements were basically machines constructed of wheels and springs between two plates separated by pillars. This was the form of a watch—basically a sandwich of gears and wheels between two plates. This continued well into the 18th century until the time of Lépine and Breguet. My father can still remember how wristwatches were not considered terribly manly. The evolution of watches has been more about refinement, I would say, than innovation. The components, layout, and design of watches evolved. But the basic principle of a watch escapement which divides time up into various small bits as it ticks remained unchanged until the advent of battery-powered timekeeping. The first escapement was the verge, which had a wheel known as a crown wheel because of its shape, which was positioned vertically inside the movement. This forced watches to be a certain thickness. During the 18th century, the verge was slowly replaced by escapements that kept all the wheels in the same plane. In fact, the cylinder escapement, which was well known during the 19th century, was originally called the horizontal escapement. Later on, thanks to the work of Breguet and others, the lever escapement was developed—the lever is the watch equivalent of the anchor escapement in clocks. If you look at the history of watches, you’ll find that watches up until the end of the 17th century were not particularly good timekeepers. The invention of the balance spring helped watches become popular because now they could be both items of jewelry as well as practical timekeepers. Until the notion of telling time by a watch or a clock became firmly established, the watch symbolized the brevity of human life. It was also a symbol of human vanity—you can see this in paintings of the 16th and 17th centuries. At first, watches were very highly decorated, often with allegorical scenes that involved how one should live a proper life. The watches of the 17th century came into existence at about the same time as a technique of painting and coloring with enamels was developed in France. The technique was basically taken from the Italian glassmakers and popularized in 1612 by an Italian named Antonio Neri. He wrote a book on how to prepare various colored glasses using mineral colors as additives. Once you had the glass finally ground, you could produce pigments which, when fired, gave you the brilliant colors. Being fairly large and having smooth surfaces, watchcases were an ideal medium for this art. Watchcases came to be highly decorated, either in enamel or gold, and jeweled. In fact, Martin Bailey, who wrote the first real modern treatise on watches, calls the 17th century the great age of decoration. It wasn’t until the timekeeping aspects of watches improved toward the end of the 18th century that you begin to see the severely plain style of watch that’s common today. A.Lang & Sohne, Germany. 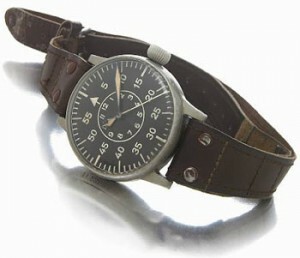 A fine and unusual massive brushed steel hacking center seconds military aviators wristwatch. 1940s. Early watches evolved from small table clocks. Watches developed in the beginning of the 16th century evolved from small German and French drum-shaped canisters. Clocks went in one direction and evolved into their unique mechanical form. In watches, miniaturization was paramount. Despite miniaturization, early watches required a fairly thick case. The names suggest their bulk. The French watches of the late 17th, early 18th century, were referred to as onignons or onions. English watches in the early 19th century were called turnips. Until the verge escapement was replaced by various horizontal escapements like the cylinder and the lever, pocket watches were fairly thick. They were also expensive and delicate and had to be carried with some care, either in a pocket or, in the case of ladies’ watches, pinned to a lapel. It wasn’t really until more reliable watches with more robust watch movements were developed toward the end of the 19th century, and until there was a clear need for watches to be more accessible for, say, military officers, that the wristwatch was developed. The first wristwatches were referred to as bracelet watches. My father, who was born toward the beginning of the 20th century, can still remember how wristwatches were not considered terribly manly, that a true gentleman would always carry a pocket watch. There’s a famous diagram published by the Swiss watch industry that shows it wasn’t until the 1930s that the production of wristwatches outstripped the production of pocket watches. Some of the first wristwatches were ladies’ wristwatches. Many were, for all intents and purposes, lapel watches that had lugs put on them to turn the case into something that could be worn around the wrist. In the middle of the 18th century, Parisian clockmakers developed a round movement that became more or less the standard. And as people were beginning to put clocks into their homes and shift from the notion of telling time by the sun and natural phenomena, many of these clocks became very highly decorative bits of sculpture. Because the simple movement could be fitted by means of one or two screws into a case, the French were able to develop a marvelous array of bronze decorative clocks both for the wall and mantel. By the end of the century, it was possible for someone to order a clock to their specifications. This, apparently, is what happened with the Washington clock, which consisted of a small statue of Washington bidding farewell to his officers and standing next to a plinth with a quotation from the eulogy delivered by Henry Lee—“First in the Hearts of His Countrymen.” This was a memorial in the sense that the sculpture evoked the kind of memorial sculpture that would’ve been produced for a famous man, but it also demonstrated the virtuosity of the French clockmakers, who produced a variety of cases and decorative clocks that became extremely popular in the 19th century. It was through this kind of innovation that the clock became part of interior decoration in the 19th century. Patek Philippe. 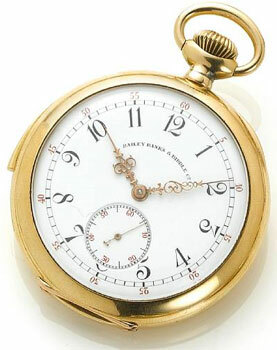 An 18k gold open face quarter repeating pocket watch retailed by Bailey, Banks & Biddle Co. 1930s. The longcase clock at the end of the 17th century came at the time when home furnishings, particularly in England and France, were evolving from rather less-elegant forms from the Renaissance to forms of furniture that we’re very familiar with—the chest with drawers, the commode. All were developed in the end of the 17th century. The arrival of the weight-driven longcase clock, with its long pendulum, revolutionized how clocks and their cases had to be designed. The design of longcase clocks drew on the furniture forms of the period. Almost from the very beginning, the form evolved in response to changes in fashion, moving from olive wood marquetry clocks to the age of walnut in England to the use of elaborate brass and pewter inlays in France. Later, in the 18th century, the same form of longcase clock continued to be made, but now it was made in mahogany. You can see how this clock was adapted and made familiar by its relation to the furniture of the period. Thus, a highly technical object (a clock with a movement) became a familiar object in homes. As clock springs become more easy to make, the spring-driven mantel-type clock appeared. Gradually the longcase clocks slipped into the background and became more your grandfather’s clock, which is how it got that name. The shelf clocks of the Connecticut River Valley, the French decorative clocks of bronze and marble, and the portico clocks of the early 19th century became the fashionable clocks of the period. Again, it was an evolution. And with the lowering of prices of these particular clocks, more and more of them appeared in homes—the clock became a part of our everyday lives. Almost until the end of the 19th century, you could open a Sears catalog and buy a very nice Ansonia or Gilbert mantel clock for just a few dollars. With manufacturing methods improving, prices came down, and more and more people had access to the clocks. At the time of the Civil War in America, the same thing happened with pocket watches. It started up around Boston. Howard and Waltham developed machinery that brought the price down to where the average consumer could afford to have one. Watch makers in general are not as well documented as you would like them to be, and watch collecting, up until a generation or so ago, was really confined to much earlier watches. It has only been since the 1950s, ’60s, and ’70s that people have begun to appreciate the wonderful 19th-century watches that were made in Switzerland. The Swiss also mechanized and improved the techniques of watchmaking. One maker who comes to mind, although he is a Frenchman, was Adrien Philippe, whose name lives on today as part of Patek Philippe. He is credited with bringing the keyless winding system into prominence. In fact, he published a book, I think it was in 1863, on how to make keyless watches. As an appendix to that book, he also wrote about how important it was to bring the Swiss watchmaking industry into the industrial age, to be able to produce precise, finely made watches in quantity. Abraham-Louis Breguet was another important innovator. Their names have been kept alive through the fine quality wristwatches that are being made today. Omega. 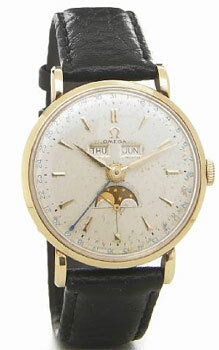 A 14k gold triple-calendar wristwatch with moon phases. 1947. The motives that get someone interested in pocket watches are probably quite different from those of a wristwatch collector. Wristwatch collecting, which really began in the 1980s, has revitalized the whole field of watch collecting. The kind of watch that you’re now seeing at watch auctions today is quite different from what you would see a generation ago. Watch auctions today are very heavily weighted towards wristwatches, both vintage watches and luxury watches that are being produced by the best companies. There is also an appreciation for the mechanical watch that was made in the 20th century until it was rendered obsolete by battery-operated watches. It probably wasn’t until that transition had taken place that people realized what they were losing in the way of mechanical watches. And even though today a mechanical watch has been supplanted by either a battery-operated watch or some other form of personal electronics, they are still wonderful mechanical works of art and can be appreciated as such, even though they may not be the most practical way of telling time. It really wasn’t until mechanical pocket watches became obsolete that people began collecting them. So it was with the wristwatch. As the mechanical wristwatch was supplanted by other means of timekeeping, people began to collect them. Rolex is a good example in the sense that it was a company that designed watches that were practical for people who were performing a specific task, be they pilots, divers, or whatever. It was very much the goal of that company to produce watches that were robust and could be used in adverse conditions that made the watch so popular. And indeed, the sports watches of Rolex are very much collected. It’s generally agreed that military officers were the first group of people to begin wearing wristwatches. At the end of the 19th century, you will find specifically designed military watches. One of the most interesting ones that I ran across was a chronograph that had a scale calibrated to tell the difference in time between when you saw the flash of a piece of field artillery and when you heard the report. This helped the wearer know approximately how far away the guns were. The idea of coordinating military operations according to a specific time developed toward the end of the 19th century, and came to its own gruesome conclusion in World War I.
Wrist chronographs appeared much later than pocket chronographs because of difficulties in making them, but, again, technology drove the watchmaking. Take the automobile racing at the beginning of the 20th century. From that sport came the notion of having a stopwatch to time races. The sports watch was born out of that sort of technological development. Rolex. A stainless steel and gold automatic centre seconds calendar bracelet watch. 1972. A watch or clock is part style and part mechanics. In the end, people gravitate toward the watches they find attractive. When someone asks me what sort of watch or clock they should buy, I always tell them to buy something of good quality, of course, but to also recognize the fact that they are going to be looking at that clock on the mantel or the watch on their wrist many times a day. If it isn’t attractive, no matter how mechanically sophisticated the item is, it really is not going to be satisfying. This is true for anyone in the market for a timepiece, not just beginning collectors. A watch is something that you look at. Yes, it provides useful information in terms of giving you the time, but it also gives you pleasure to look at it. And as with any decorative object, part of the benefit of owning it is that pleasure. I think people start to collect anything because they’re intrigued. My advice is to study the subject as much as you possibly can. There are now many good new books from the past 10 or 15 years on various kinds of wristwatches and watches. Those are a good place to start. There are websites devoted to watches and watch collecting. With the Internet, there is just a huge amount of information that’s become available over the past few years. I think the collector who is well informed is going to be the most successful and get the most satisfaction out of it. There are differences, of course. Again, it depends on what is perceived by collectors as being desirable. Price is driven by appearance but also the complexity of the watch, its complications. In general, the more functions a watch is able to perform, the more expensive the watch is. There is also the matter of style. For example, there are many Rolex watches of modest value, but the sports models are particularly sought after, and their value is many times that of what is essentially, in mechanical terms, the same watch. But because of the innovative design or the story associated with it, collectors find those much more desirable and the price is consequently higher. For the beginning collector, I think the first prerequisite is to find something that fascinates you about a particular watch or a particular group of watches and pursue that. It’s an intellectual as well as an inquisitive process. I have seen a lot of marvelous pieces at those shows. But much of the watches that have survived to today were only made in the past hundred years. So, in the scheme of things, there really are very few watches that are truly collectible. Consider the fact that Waltham or Elgin both made in excess of 50 million watches. Watches have always been a prized possession, so they tend to survive. I don’t think anyone really throws away a watch. The vast majority of material that exists today has sentimental value. It’s rare to find something whose value is completely unknown to the owner. 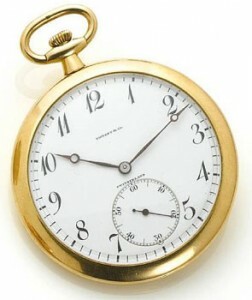 Tiffany & Co. A fine 18k gold open face pocket watch made by Agassiz Watch Company, Switzerland. 1910. I think that there are still great opportunities in watch collecting. As with almost any collecting field, there are a few highly desirable pieces that command both the price and the publicity. But, as I said, there are many watches out there, and they all have very interesting stories or interesting complications. An example of something which is of relatively modest value is the American railroad watch, which came into being as transportation improved and it became necessary to accurately time the schedules of passenger trains going across the country. This type of watch served a particular need at a particular time, and was an area of active innovation on the part of American watch companies. Similarly there are Swiss watches of the 19th century, particularly the repeating watches and the chronographs, which exist in a bewildering variety and are worthy of being collected, even if they’re not signed by Patek Philippe or some other famous brand. The quality is there. Do you know when Agassiz made the last pocket watch for Bailey Banks & Biddle? Also, how old do you think an Agassiz pocket watch is with a serial number of 236000? Very nice article. I had seen a Bulova vintage men’s watch, perhaps 30s, 40s or 50s with a swiveled face that the wearer could place a small photo that would be hidden by the face. Question is if you have heard of such a watch made by Bulova, and if you know if there is one for sale? Have inherited Longines Deck Watch in silver 800, serial no. 2975665. Longines records show watch wa sold to it USA agent, Wittenauer & Co. on 31 July 1919. Am trying to track history from there, however Bulova states it only acquired Wittenauer name and not company records. Watch was last owned by my grandfather, retired German naval officer (1939) but watch outer case ingraved U.S.NAVY on first line and an N inside a circle with a diagnal slash out side the circle followed by number 4222. Serial number is on movement and inner and outer case. Any clues on how to proceed in tracking ownership history? my father-in-law has given us a pocket watch that belonged to his grandfather. From what we know it is gold, french made, with cylinder movement. (by the way, my father in law will be 90 in May)No one locally seems to be able to tell us much about it. It was appraised in 1989 by a local jeweler. They described it as a key wound antique pocket watch, cylinder movement, 4 or 5,valve inside back- foreign. It is not working. We visited our jeweler today with a yellow gold Hamilton Flintridge Hunting wrist watch. He found the watch in a book, which shows it was made in 1934. However it is only shown in 1930 in the Hamilton Watch Co Catalog – online. I don’t have the serial number. It is in excellent condition, still runs well (hadn’t been wound since ?? ?, my uncle passed away in 1976) The book shows the movement to be 979. The price in the book is 14 K YG $1400-1500. My uncle owned a jewelry store in Kansas City, Mo. and he was a watchmaker. Where will I be able to obtain an insurance appraisal? Do you have any idea of the value? This watch is for my son (40.
dial and movement Z.J.Pequignot, a Philadelphia Jewelry establishment. The beautiful high grade Swiss movement has been recased. It has the snap-on/friction fit dial. When was it made? At what period in time did Wittenauer make pocket watches? Later into wrist watches, they merged with Longine. I have a vintage Longines pocket watch, appears to be silver, with the initials of “ARW” on the back, any idea who the watch might have belonged to? Zephern Pequignot was my great-grandfather, father of Frank C. Pequignot, Sr., jeweler and renowned pearl expert, who had his jewelry establishment in Philadelphia, I believe near Market St. Zephern J. Pequignot was a great grandson of John Hesser, a soldier in the Continental Army. He opened his watch and jewelry establishment in Phila. in 1854; He died in 1909. This can help you narrow down the date when the watch was made and add some historical information to it. I have a ladies wristwatch that was not new when I received it more than twenty years ago. It is Swiss made, number 80458, in a round gold case, sturdy, stay bright back,3/4 inches in diameter. Words Governor and 17 jewels on face below the 12.numbers gold. Gold color expansion bracelet. Watch works well.A goldsmith told me it has l7 rubies. I am interested in knowing its history and value. Also where to find collectors. I am searching for one specific pocketwatch. I only know that it had a 40s-50s train locomotive inscribed inside front cover. It may have had “Charles” or “CEO Jr.” also. I last saw it in Phila. in 1956 and it belonged to my Dad, Charles E.Oldroyd Jr. Is this a good venue to ask such a Q? Please, and Thank you for your help..Dennis in So.Jersey. I am a direct desendant of Johann Heinrick Heilig who went by the name Henry Heilig, and who, along with his family, made clocks from the mid 1700s until the late 1800s. Recently a musical clock works was found marked “H. Heilig Hanover”. Do you know of, or have you seen, any clocks by H. Heilig? I am a direct desendant of Johann Heinrich Heilig, who came to America 1n 1720, went by the name Henry Heilig and was married to Susannah Rittenhouse the aunt of David and Benjamin Rittenhouse. Henry Heilig, a clockmaker, is listed in an article in the American Journal of Philosophy as the only man with the technical skill to build the venier compass. He or members of his family his family were clock and watch makers in the Germantown, Hanover and Philadelphia. Recently an H.Heilig musical clock was discovered – the only know work by Henry Heilig. Does anyone know of the existance of other works by H. Heilig? Please let me know because this is very important family history and we don’t want to lose it. Hello Mayhaps you can help me Out here a bit. My grandfather passed away ad in His safe was a pocket watch promised to me as a child. ( Im still pretty young ) 20 now anyways. It has 6 timezones then a small dial on the bottom of the watch. it has blue gems enlayed in the face , gold trim inside the watch around the jewls. Now , here is what confuses me… The timezones. Shanghai , Pekin , Hong Kong , singapor , tientsin Hankeou? Not sure im kinda blindish lol. The Watch is supposedly .935 silver content which someone told me was Higher than sterling? I really am clueless but no watch smiths or places here have any clue what this watch is. The bottom of the face of the watch says ( depose N Some kinda sybol then 4975. Does any of this make sense to you , If I get some pics would you be able to help me out identifying this timepiece. I have a clock about twelve inches tall with the likes of F.d roosevelt beside a ships wheel. It has a banner across the top with N,R.A. on it. I know that the National Restoration Association was in effect in ’34-’35 and was a Roosevelt progeam. the clock is electric with a very simple motor and it works. I haven’t been able to find anyone who can give me an appraisal. Can you help? Some of the greatest watch makers were HQ’d in the US, specifically the Gruen company. Gruen partnered with Swiss watchmakers and then cased the watches here. For example, the Gruen ‘Dr’s Watch,’ which uses a Cal: 330 movement, was the predecessor of the Rolex watch and looks identical to it — The movement is EXACTLY the same because the same factory made both movements. 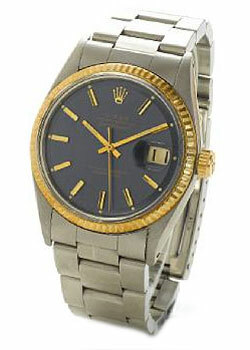 Rolex, which everyone prizes, used Omega movements and other Swiss movements until it FINALLY began making its own…OMG! In a current auction, they have a Rolex Dr’s Watch with an estimate of $8K to 12K… and it is Exactly the same watch internally and externally as the Gruen Curvex with the Cal 330 movement! The Cal 330 Curvex movement, by the way, was designed so that a larger gear train, creating greater accuracy, could be incorporated into a wrist watch. With the Curvex and similar variations, the shape of wrist watches transitioned from round to rectangular or square. The Swiss were stunned by the ability of American companies to mass-produce quality movements incorporated into such pieces as the Illinois and Hamilton pocket watches. Speaking of Illinois: When Illinois came out with their radium dial’d watch faces, they used women to apply the radium with fine paint brushes… Well…many of the women found it intriguing to paint parts of their body, including teeth, so they could ‘glow’ in the dark. Ultimately, most of these dial painters became ill and died, thanks to radium poisoning (just a little piece of history). watches had a certain cachet that firms like ‘Timex’ did not. Clearly Timex was not a great watch but it was okay for normal use. Some of the Gruen Curvex watches, by the way, cost as much as $4,000.oo dollars US for a 14K, so owning an early wristwatch was not a cheap affair. Even the cheapest of the Curvex’s cost $1,000.00 in today’s bucks — A large investment for something you wore on your wrist! I have a pocket watch dated 1832 Bailey Banks and Biddle. Ref# 65800. Hi Grade Minute Repeating movement with double split second chronograph with crown at the 3 oclock. It belonged to a great great grandfather David R. Thomas founder of the blast fired furnice. I think the pocket watch was purchased in PA. I was told the pocket watch could have been a private label by Patek Philippe. Do you by chance know anything about this pocket watch. Any information would be greatly appreciated. Thank you! Can you give me any information on a pocket watch? Rolex standard on dial face, 17 rubies movement, Swiss made, no name on the movement and no serial number; in a Keystone Victory case. Did Rolex make a standard watch that had no name on the movement? Did E. Howard name their cases “Keystone Victory”? Did Keystone Victory produce pocket watch cases for Rolex? What era do you think the pocket watch was from? I have a French pocket watch which is enclosed in a silver plate stand up case along with the case that covers the watch. It is quite old and has the symbol if three pyramids and a palm tree in the upper third section of the watch. The inscription on the back of the stand up case is R&C. I have researched the origin of this vintage watch and cannot find any clues as to who manufactured it . Thank you in advance for your assistance.